My Mother and the Houseguest is a remarkable gem by the late director, Shin Sang OK. While it's a rather conservative tale told in the tradition of Corean melodrama, it's done with such a high level of polish and points out societal tensions at the dawn of modernization in Corea while telling a touching story about loneliness and impossible love that it's hard not to consider this film as something beyond the ordinary. The story centers on the family that resides in the "widows house", where mother-in-law resides with her late son's wife and daughter, along with their housemaid, also a widow. Their day to day existence is shaken up by the arrival of a man, friend of the mother's brother, who takes up residence in their guest room. However, due to the cultural traditions of the time, it was considered unfaithful to the late spouses if widowers and especially widows were to see other people. Throw in some tension with some mistaken identities and conflict between filial loyalty and the passions of one's heart and you have a potent brew for a classic melodrama. Narrated by the daughter (clearly a voice-over by an older actress), the picture manages to keep the mother and the houseguest from interacting throughout most of the film while still conveying a surprising amount of attraction between the two, often using the precocious daughter as a bridge. It's both the impressive feat of subtlety used combined with strong moments of melodrama, seen between the non-interactions between the mother and guest as well as a touching scene between the mother and her mother-in-law that really sell this film. Combined with some impressive aesthetic choices in shooting, solid performances by the thesps, this film would be notable, but some of the imagery used to convey the contrast between traditional culture and modern culture and the conflict therein is also quite surprising. Using the housemaid and her suitor to contrast with the wealthier mother and her suitor to say something about class, tradition, and the conflicts between the way of the past and the present are quite effective and also, pay attention to the presence of trains, which I suppose you can do in many Corean films. 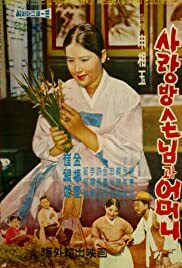 My Mother and Her Guest is a notable old melodrama, while not opaquely subversive, still manages to say a thing or two about society at the time of its making (1961) and also provides an emotional force of entertainment. I don't think everyone will find this film as potent as I did, but this was the film I watched many years ago that cemented a then curiosity about Corean film into a love for it. 9/10.